The hormone replacement drug Premarin comes from pregnant mares' urine — that's how the drug got its name. But in order for the giant pharmaceutical corporation Pfizer to create Premarin, first it needs to make sure it has access to lots of pregnant horses. These mares are repeatedly impregnated, on average 12 years, and spend 6 months of their 11-month pregnancy confined to stalls so small they have difficulty turning around or lying down. Most of this time is spent standing up on cold concrete floors. During this time, they are permanently attached to cumbersome rubber urine collection bags hanging between their hind legs, so Pfizer can collect their pee and use it in their products. These uncomfortable bags chafe their flanks, cause infections, and severely limit movement. Water intake is routinely restricted to concentrate the amount of estrogen in their urine, which sometimes causes life-threatening renal and liver disorders for the animals. The fate of the foals — the "by-products" of the industry — and the mares who cannot conceive is bleak. Most are sold at auction to "kill buyers" and ultimately end up at the slaughterhouse where they will be improperly stunned, dismembered, butchered and their meat sold for human consumption in countries where there is an appetite for it. Although Pfizer / Wyeth has significantly downsized the number of PMU farming operations in North America, Pfizer's projected annual sales for HRT therapies — Premarin® and DUAVEE® — are over one billion USD by 2015. In 2012 alone, total sales of the available Premarin® family of drugs were in excess of $1 billion USD with expected revenues of at least as much in 2013. What was once compelling evidence that they had moved these facilities to other parts of the world has since been confirmed — a thriving PMU industry has existed in China for close to ten years. There is also evidence to suggest that such farms are situated in other countries, such as India, for example. What was and is today a brutal industry, with abysmal treatment of the pregnant mares and their foals in North America, will prove to be even more devastating in countries seemingly more accepting of animal abuse, horse slaughter, and the consumption of the meat from these heinous practices. 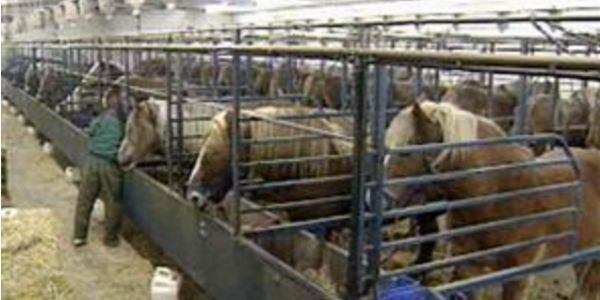 Let's stop Pfizer from making billions of dollars from these tortured horses!